Discussion in 'Lasershow Designer QuickShow' started by MeaningOfLights, Dec 28, 2015. For some reason (after a Windows 10 update I suspect) Pangolin Quick Show would not detect my FB3. It was working perfectly last night. The light was green on the FB3 and everything I tried (Laser Controller Hardware, Projector Settings and etc) didn't work. All I could see was Demo Projectors. I reinstalled the Windows7 driver "DriverInstaller64.exe", even though it was already installed. I know I am using Windows 10 (on a Surface Pro3) but I couldn't see any Windows 10 specific drivers and after installing the Windows 7 drivers and opening Quickshow the FB3 was immediately detected. Whether this is the correct solution, it works and I hope its saves someone else. Also a heads up for the Pangolin Dev Team. Thanks for posting the solution. Note that, in the dialog box above, you need to SELECT (it means "click on") the FB3 in the list, and then click the "up arrow" button, to move that projector into the position of "Projector number 1". 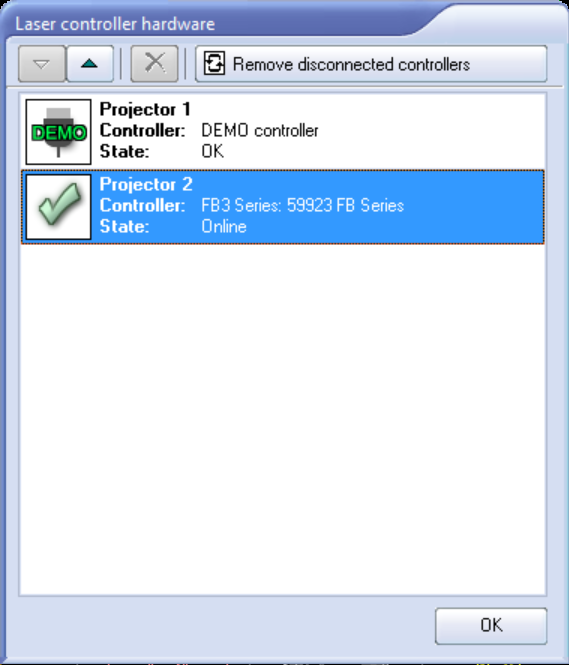 After that you can click on the Demo projector and delete it by clicking on the X button.